Vida Movahedi, the woman whose public display of peaceful protest against Iran's compulsory hijab law was captured in a viral photo, remains detained in Gharchak Prison for women south of Tehran despite being eligible for release. On April 14, 2019, her attorney, Payam Derafshan, told the state-owned Islamic Republic News Agency (IRNA) that Branch 1091 of the Guidance Court in Tehran on March 2, 2019, had sentenced Movahedi to a year in prison for that action under the charge of "encouraging people to corruption and prostitution." 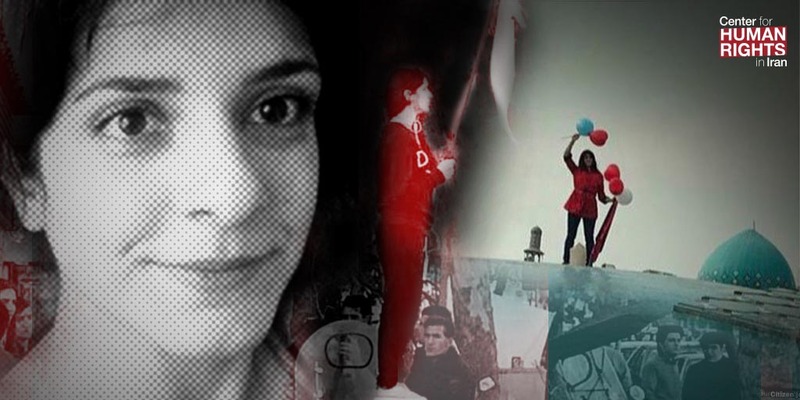 Her request for temporary release has been approved but not yet enforced for unknown reasons, according to Derafshan. "The reason for publicizing this case is that this prisoner is being unlawfully held in detention even though she's eligible for conditional release," the attorney said on a post on Instagram on April 15. He added that Movahedi, having already served five months of her sentence in detention, had also been granted a special pardon on the occasion of the anniversary of Prophet Mohammad's prophethood, "So why hasn't she been freed yet?" Derafshan also noted that Movahedi's two-year-old daughter "is feeling sick from not being with her mother" and "naturally mother and daughter desire being together as soon as possible." For her December 2018 protest, "Vida was held at the Vozara Detention Center for 24 hours and then released," a source with knowledge of her case told the Center for Human Rights in Iran (CHRI) on condition of anonymity. "Later she was slapped with a fine that was paid in full by her family." "The second time ([October 23, 2018] she was again taken to the Vozara Detention Center and after a few days they transferred her to Gharchak Prison," the source added. "She's currently in a ward with dangerous inmates and not in a suitable situation at all," said the source. "But like all other prisoners in the public ward, she's allowed visitation." Article 638 of Iran's Islamic Penal Code specifies penalties for women caught not wearing the government-mandated hijab in public, "Women, who appear in public places and roads without wearing an Islamic hijab, shall be sentenced to ten days to two months' imprisonment or a fine of 50 thousand to five hundred rials." However, the defendants can also be issued harsher sentences for not abiding by the hijab law under different charges. Movahedi has been detained in Gharchak Prison since her second public compulsory hijab protest on October 23, 2018, when she waved her hijab along with white and red balloons while standing on a dome in the middle of Revolution Sq. in Tehran. Initially identified on social media as Vida "Movahed," Movahedi publicly protested against the hijab law for the first time on December 27, 2018. She did so while standing on a utility box on Revolution St. in busy central Tehran while waving her white headscarf with her hand. A photo of her doing so went viral on social media networks and made international headlines. Dozens of Iranian women followed suit in the coming months and at least 30 were arrested in 2018. They came to be referred to as the "Girls of Revolution Street."